Nothing says Spring like the arrival of fresh asparagus to your local market. Pair it with this tangy and healthy twist on traditional ranch dressing. In a medium bowl, whisk together yogurt, garlic powder, onion powder, pepper and salt. Slowly pour in buttermilk, whisking constantly. Mix in chives. For best results, make dressing ahead of time and let sit in refrigerator overnight. Wash and break ends off of asparagus. 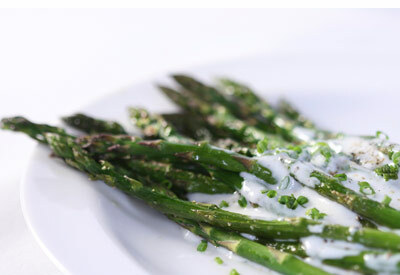 On a baking sheet with a lip (like a jelly roll pan), place asparagus and drizzle with olive oil. Sprinkle with salt and pepper; toss until fully coated. Cook for 10-12 minutes (depending on size of stalks.) Let cool 5-10 minutes before serving.